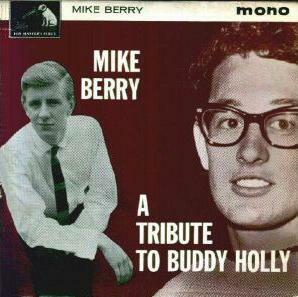 As far as most record buyers were concerned Mike Berry burst on to the scene with his "Tribute To Buddy Holly" in 1961. Fans of the legendary Texan rock and roller loved and hated the record in equal measure. There is no doubt now that the song was very much a tribute because Mike and his producer, Joe Meek were Buddy Holly fanatics, but many of the late singer's followers thought it was just exploiting Buddy's name for profit. It wasn't a unique tribute; there had been the rather mawkish 'Three Stars' from Tommy Dee which had been a chart hit in the UK for Ruby Wright in 1959. Incidentally, a version was also recorded by Eddie Cochran- though, ironically, few people heard it until after Eddie's own death a few months later. 'Tribute To Buddy Holly' was a good deal closer to the style adopted by Holly on his early singles and featured a prominent drum driven rhythm not dissimilar to that on 'Peggy Sue'. Joe Meek had tried out Mike Berry a few weeks earlier with his version of the Shirelles' 'Will You Love Me Tomorrow'- a song with lyrics that seem quite unsuitable for a male singer to tackle. Mike was backed by the Outlaws, a band already recorded by Meek as instrumentalists, so Berry's first two singles were not the band's first outing on record. The same musicians regularly did sessions at Meek's Holloway Road studio where they were used to back other singers- Freddie Starr, Glenda Collins and John Leyton among others. Billy Kuy, Reg Hawkins, Chas Hodges and Bobby Graham were the original 'Outlaws', but as personnel changes took place by 1964 they had evolved to Ken Lundgren, Ritchie Blackmore (later with Rainbow), Chas Hodges (who became half of Chas & Dave), and Mike Underwood. They had originally called themselves the Stormers, but were renamed by Meek who thought it a good idea to promote them with a 'Wild West' image- the group dressed accordingly. Joe also thought of the name Mike Berry because it had closer 'Buddy Holly' connotations than the name previously adopted by the artist, 'Kenny Lord'. Mike's third release featured the Outlaws, but actually credited 'The Admirals'- an incident that infuriated Meek allegedly caused by a misheard telephone conversation. Mike had two EPs issued, both of them produced at Joe Meek's Holloway Road studio. Possibly, this one on HMV 7EG8808 is slightly the easier to find. Almost all Mike's records were unashamedly trying to fit the Buddy Holly mould; these included his most successful, 'Don't You Think It's Time' which, although a product of songwriter Geoff Goddard and Meek magic, could easily have come from the Holly catalogue itself. Mike Berry split from Meek as the sixties progressed and signed with Robert Stigwood who was trying to grow the music side of his business. Sadly for Mike this did not improve his record sales. Despite trying very hard for the rest of the decade and beyond he had to remain content with the minor hits that he'd achieved through the imaginative efforts of Meek and the Outlaws. He had much more success with acting and became a familiar face on TV in series like 'Are You Being Served?'. However, with the help of his old mate and most regular 'Outlaw', Chas. Hodges, Mike broke the charts again with a couple more singles in the early 1980s- the best of these was 'The Sunshine Of Your Smile' which reached an unexpected #9 in August1980. Singles up until HMV POP1142 were with the Outlaws, POP1257 to POP1314 had backing from the 'Innocents'.